According to the Centers for Disease Control (CDC) approximately one in 25 hospital patients acquire at least one infection during their stay. These findings are alarming and have triggered an urgency to address the issues surrounding patient acquired infections. Facilities managers and infection control practitioners (ICPs) are aware of how bacteria and mold grow in and on horizontal and vertical surfaces. It wasn’t until recently that sinks, countertops and wall cladding were studied as potential sites for the spread of disease. Plastic laminate finishes on healthcare casework and wall cladding have seams and exposed edges that can harbor bacteria. Laminate is actually compressed paper; while it is dense and may appear to be non-absorbent, it is porous and will absorb moisture over time. If caulking around a sink or other seam location deteriorates, water will penetrate into the laminate and the substrate below. The substrate is usually wood or particle board. Wet wood will harbor bacteria, especially Aspergillus fungi. A solution to these problems can be found by utilizing solid surface which inherently inhibits bacterial growth. By creating a seamless, nonporous surface where pathogens can’t grow, solid surface can help with control issues and maintenance. Solid surfaces such as Corian, Avonite, LG or Krion can survive the impacts, nicks and cuts that ruin most wall surfaces. It is renewable, repairable and reusable. 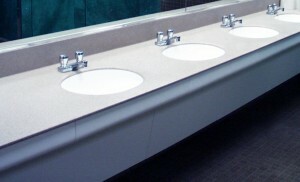 If the solid surface is damaged it can be repaired onsite, saving labor costs and resources. While warranties may vary from manufacturers, some will guarantee the material for as long a ten years. Solid surfaces have proven superior performance in healthcare applications such as wall cladding, casework, countertops and more. 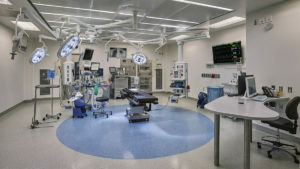 Let us ASsiST you protecting the health of others with our custom solid surface fabrication. Contact us today for a quote. 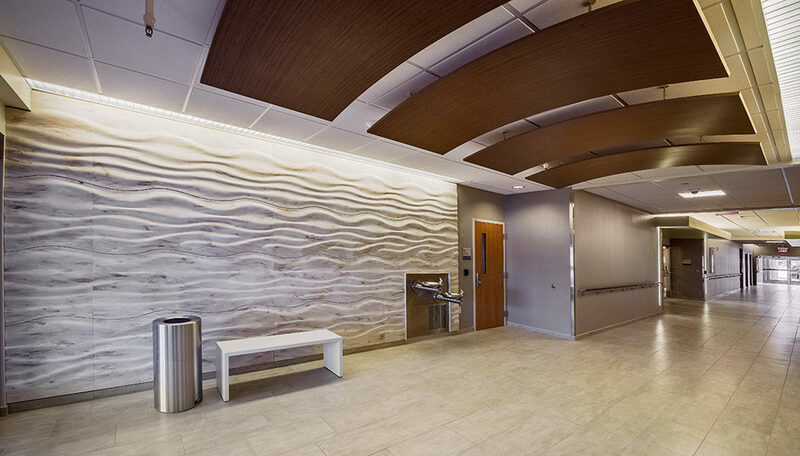 Solid Surface design and fabrication has changed dramatically within the last 25+ years. Architects and Designers today are creating radical designs that include a wide variety of complex geometric forms. Have you ever had an idea for a 3D design in solid surface but decided not to go ahead with it because it was too complex? The problem has been how to take a 3D design drawing and translate it to a solid surface 3D form. In the past, creating molds and parts with hand and/or power tools would have been cost prohibitive to fabricate. Today, 5-axis machining solves all of these issues, reduces lead times and increases efficiency. 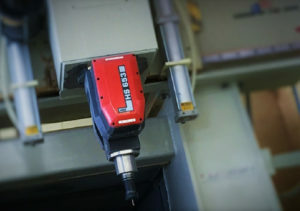 So what is 5-axis CNC machining? The term refers to the ability of the machine to move the bit in five different axes at the same time. 5-axis machines can rotate on additional axes which allows the bit to cut the materials from all directions with no limits. Software programs are utilized to create the 3D models necessary for the CNC machine to cut the required parts. ASST has an amazing 5-axis CNC router with a 5’x10’ table. Our talented team uses this technology to create 3 dimensional molds for thermoforming solid surface and cutting repetitive complex 3D parts with solid surface materials. Reintroducing thermoformed parts to the 5-axis and final sizing allows very complex shapes to be recreated. This is done at a level of precision that is uncommon in commercial construction. The project process is completed with final hand assembly, finishing and/or shipping and installation to the designer’s desired specification. Take off the constraints of solid surface in two dimensions. We Go Beyond Surface Level Solutions even in our manufacturing processes. Contact ASST for all of your 3 dimensional solid surface needs.